You are here: Home / Blog / General Information / Born in September? Lucky you! Sapphire is Your Birthstone. Born in September? Lucky you! Sapphire is Your Birthstone. Sapphire is the birthstone for September. We have beautiful sapphire jewelry for you or that special someone. Come in to House of Diamonds to see our selection, or talk to Karen about creating a custom item with a sapphire as the focal point. The word sapphire comes from several ancient languages: the Arabic safir, the Latin sapphirus (meaning blue), and the Greek word sappheiros for the island of Sappherine in the Arabian Sea where sapphires were found in ancient Grecian times. In the Middle Ages, Sapphire was believed to protect those close to you from envy and harm. It also represented loyalty and trust. The biggest source of sapphires world-wide is Australia, especially New South Wales and Queensland. 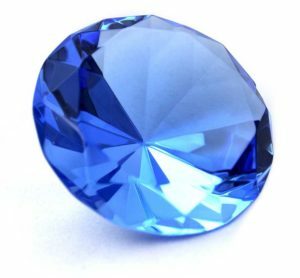 Blue sapphires range from very light to very dark green or violet blue, as well as various shades of pure blue. The most prized colors are a medium to medium dark blue or slightly violet blue.